The business environment of Nelson Mandela Bay is characterised by competitive Infrastructure, favourable conditions for export, first-world financial institutions, and a socio-political landscape which provides an environment that is conducive to investment. Nelson Mandela Bay offers a powerful strategic export and manufacturing platform for investors to achieve a competitive advantage on a global scale, cost reductions and new market access. The area’s strategic position, midway between the west and east coast, grants significant advantages over other competitors, in particular providing for the growth of niche exports. Furthermore, the 11 500 hectare Coega Industrial Development Zone (IDZ) and the Port of Ngqura position the Nelson Mandela Bay region as the strategic trade link to both east and west markets. The two ports, the Nelson Mandela Bay Port and the deep-sea Port of Ngqura provide opportunities for export based manufacturing. 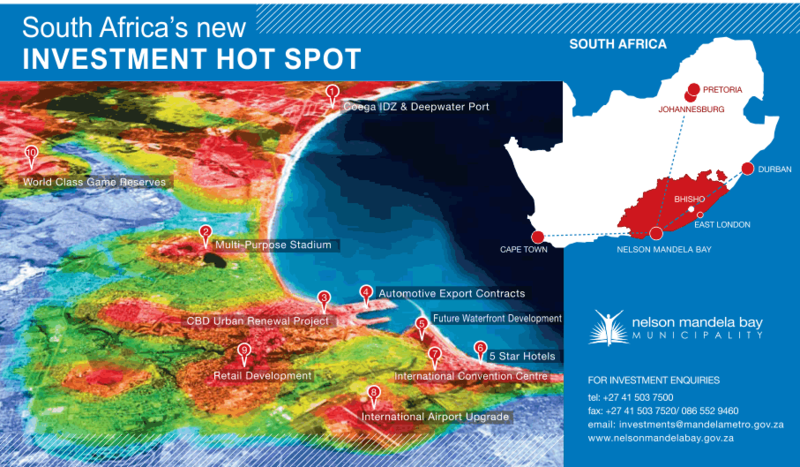 The Port Elizabeth airport, road and rail infrastructure links to other major centres in South Africa also adds to the ease of doing business in Nelson Mandela Bay. Furthermore, the Nelson Mandela Bay Logistics Park provides infrastructure and services to the motor industry in the area. First-world financial institutions provide specialised and professional business services in all fields and are on par with those on offer globally. South Africa’s highly competitive banking and finance industry sees bankers, financial advisers, lawyers, tax consultants and experienced chartered accountants able to advise foreign banks on legal issues and guide them through regulatory requirements with on-going auditing services. Financial institutions are able to offer a full range of banking activities, including trade finance, foreign exchange trading, offshore banking and trust management. Commercial banks provide assistance to exporters in securing payments, while certain major financial institutions have international trade divisions offering more specialised services. Financial packages, covering building finance and that for plant and equipment, as well as working capital and fixed rate finance, are designed to put industrial undertakings on course with the minimum of time and trouble. The climate of socio-political stability in the Eastern Cape as a whole is conducive to economic growth and new investment in industrial activity, tourism and small business development. Furthermore, the Nelson Mandela Bay Municipality adheres to high standards of local management and sound institutional capacity. The institution proactively seeks out, promotes and facilitates job creation opportunities through investments in all the key thriving sectors, while focusing on sustainable economic, social and environmental development. At the forefront of strategic initiatives aimed at increasing the area’s attractiveness to foreign investors is the Nelson Mandela Bay Business Chamber (NMBBC). It plays a key role in broadening the local, national and international business sector’s awareness of Nelson Mandela Bay’s advantages. NMBBC specialises in lobbying for and representing local business, and ultimately aims to establish the area as the ‘East coast gateway to southern Africa’. NMBBC has also been instrumental in facilitating a localised Business Confidence Index, affording businesses the opportunity to access vital information about economic developments in the region. Providing comparisons with the rest of the country, this key initiative is an essential planning tool for businesses operating in the region and those considering opening offices. The index assists decision-makers to make future projections and sound investment decisions, enabling businesses to position themselves more competitively in relation to other cities, both on a national and international basis. The data can be utilised for compiling business plans, preparing for possible expansions and marketing campaigns.